Red Sox manager John Farrell announced following Sunday's game that left-handed starting pitcher Henry Owens will be called up to Boston. He will start on Tuesday in place of Rick Porcello, who was placed on the 15-day DL earlier, and make his major league debut against the New York Yankees in Yankee Stadium. Owens, a supplemental first round selection by Boston in 2011 out of high school, has been very impressive of late for Pawtucket. Overall in 2015, he is 3-8 with a 3.16 ERA over 122 1/3 innings, spanning 21 starts. Owens had trouble controlling his pitches early on, walking at least four batters in seven of his first 12 starts. He has been much better lately, and has not walked more than two batters in his last nine starts, all of which have lasted at least six innings. He has a strikeout-to-walk ratio off 52 to 14 in that span. Owens earned his way to Pawtucket last season on August 4 after posting stellar numbers with the Portland Sea Dogs. In Double-A that year, he went 14-4 with a 2.60 ERA and 126 strikeouts in 121 innings, earning him Eastern League Pitcher of the Year honors. The year before, in 2013, Owens was named the SoxProspects.com Pitcher of the Year by going 11-6 with a 2.67 ERA and 169 strikeouts in 135 innings combined with Salem and Portland. Owens has always been tough to hit, limiting batters to a .207 batting average for his entire minor league career that spans 518 innings. 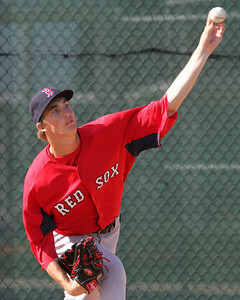 Owens' early season struggles were seen first-hand by SoxProspects.com's Director of Scouting Ian Cundall. He watched Owens pitch on April 29 against the Syracuse Chiefs, a start in which he labored through five innings. Cundall noted that he had trouble with command, control, and his delivery. Assistant Director of Scouting Chaz Fiorino then saw Owens on May 15 when he pitched much better. Most notably, Fiorino says that Owens' changeup is easily a plus-grade pitch. Owens stands tall at 6-foot-7 and uses a three-quarters arm slot. He throws four pitches: a fastball, changeup, curveball, and slider. The changeup is his best pitch, but he has worked this season to tighten up the curve, which could be slow and loopy at times. He did not start throwing a slider until this year, and uses it sparingly. His fastball sits around 88-91 MPH, but can touch 94. Owens was not on the Red Sox 40-man roster, so a roster move is needed. He began the season as SoxProspects.com's third-ranked prospect, and is currently fifth.